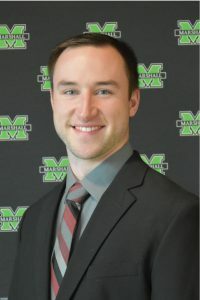 Find contact information, including email and telephone, for Marshall University Recreation Center administration and staff. Bob has served as the Director of Campus Recreation since 2015. 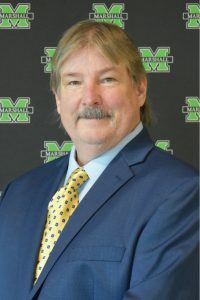 Prior to his time at Marshall, Bob held positions at Cleveland State University as well as the University of Alabama at Birmingham. Bob holds a Bachelor’s Degree in Communication and a Master’s Degree in Higher Education, both from Kent State University. Outside of work, Bob enjoys spending time with his wife and son, playing with his dog, running and watching college football. Mike started as the Associate Director of Facilities and Operations in October of 2018. 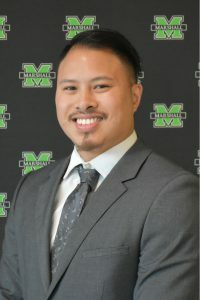 He has been working in Campus Rec since 2010 at Cleveland State University. 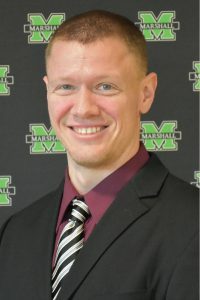 Mike holds a Bachelor’s degree from Ashland University and a Master’s degree from Cleveland State University, both with a concentration in Sports Management. Some of his responsibilities include oversight of the facilities and operation staff, facility space reservations, and financial management. In his spare time he likes to workout, compete in obstacle races, watch movies, and enjoy time with his pets and fiancé. Cindi Tscherne is the Associate Director of Programs at the Marshall Recreation Center. In her current role, she oversees fitness, well-being, adventure recreation, aquatics and competitive sport programs. 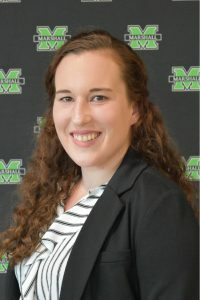 She has been at Marshall since December 2016, but she has worked in the field of recreation since 1980 and specifically in Campus Recreation for the past 10 years. Originally from Cleveland, Ohio, Cindi graduated from Bowling Green State University with a B.S. in Recreation and from Baldwin Wallace University with a M.A. in Education. When she is not working she can be found at home with her husband Joel and their “Herd” of 3 dogs and 4 cats. She loves working in her yard, cooking or spending time with her children and grandchildren. Serving as the Assistant Director of Marketing & Membership, Kayla is responsible for the oversight and development of departmental brand management and enhancement through print, digital and social media. Her responsibilities include website management, graphic design and campus & community event representation. In addition to marketing, she oversees memberships, the Pro Shop and the front desk staff. 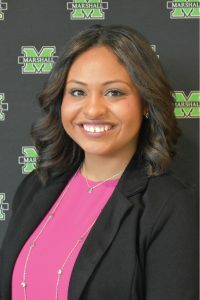 Previously, she also worked in marketing and memberships at the Marshall Rec during her undergrad and graduate years from 2009 through 2014, while attending Marshall University. Kayla enjoys to bake, spend time with family and friends and play with her dog Phoebe. 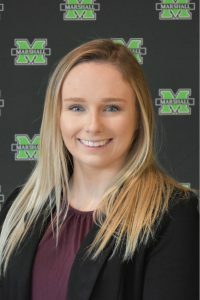 JoEllen began her time at the Marshall Recreation Center in May of 2017, and is currently serving as the Assistant Director of Fitness & Well-being. She came from Southeast Missouri University where she earned both her B.S. in Health Management and Exercise Science, and her Masters of Public Administration. Her main responsibility is overseeing the group fitness and personal training program. When she’s not at work, she enjoys cooking, trying new things, and spending time outdoors. Eric was hired in June 2018 to take on the role of Coordinator of Aquatics and Safety. This is his first professional position after finishing up his graduate assistantship at The University of North Carolina at Greensboro. In his current role he oversees Aquatics on-deck operations, including: staff development, scheduling, certification courses and swim lessons. Before graduate school, he attended NC State for his undergraduate years from 2011-2016, working in areas including Aquatics, Facilities and Special Events. In his spare time, when not working, Eric can be found enjoying the outdoors with his girlfriend and adorable puppy Nox. Richard serves as the Facility Service Technician at the Rec. In this role he oversees preventive Maintenance for all exercise equipment and assists with facility upkeep projects. His previous professional experience includes positions as the Operations/ Maintenance Superintendent at DSI Underground as well as Maintenance Supervisor at Minova USA. In his spare time he likes to drive golf balls and his vintage Corvette. 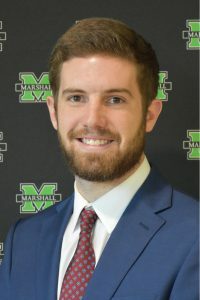 Brett graduated from the University of Wisconsin La Crosse in spring of 2017, and is currently serving as the Graduate Assistant for Competitive Sports and Camps. He is pursuing a Master’s degree in Sports Management and loves the West Virginia country. Brett enjoys spending time hiking, hunting, playing guitar, watching his Wisconsin sports teams and hanging with his cat Khalvin. 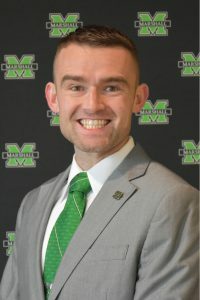 His favorite thing to do is play disc golf, and he serves as the president of the Marshall Disc Golf Club. His favorite quote is, “The Green Bay Packers never lost a football game. They just ran out of time.” by coach Vince Lombardi. 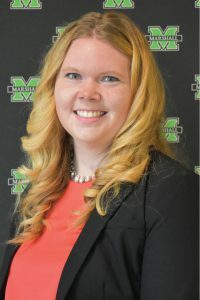 Kaitlin Slayton has been a part of the Rec Team since August of 2012, where she attended Marshall University for her Bachelor’s degree in Science. She is currently pursuing her Master’s in Exercise Science and hopes to attend PA school in the future. She currently teaches Silver Sneakers and Hydrofit classes along with private & individual swim lessons. She loves to workout, travel, spend time with her fiancé and play with her cat Marco and dog Lily. Clarissa graduated from West Virginia University in May of 2017, and has since been pursuing her Master’s degree in School Counseling. She joined the Rec Team in May of 2018, working with Youth Programs and Competitive Sports, and is currently serving as the Graduate Assistant of Marketing & Membership. Clarissa enjoys hanging out with friends, dancing, traveling, working with children and anything involving puns. Similar to a dentist, her favorite time is 2:30.